So, I started by looking at the creatures of the deep attraction, and what might replace that once its time is up. I quickly realized that any development would need either a large concrete wall, or to be elevated so the area can still operate during Jet Stunt Extreme. The obvious way to do that would be to theme it after one of those Pleasure Piers that are popular all over the world, but are curiously lacking in Australia. This creates a new themed area, that exposes people to something new, while also seeming familiar. 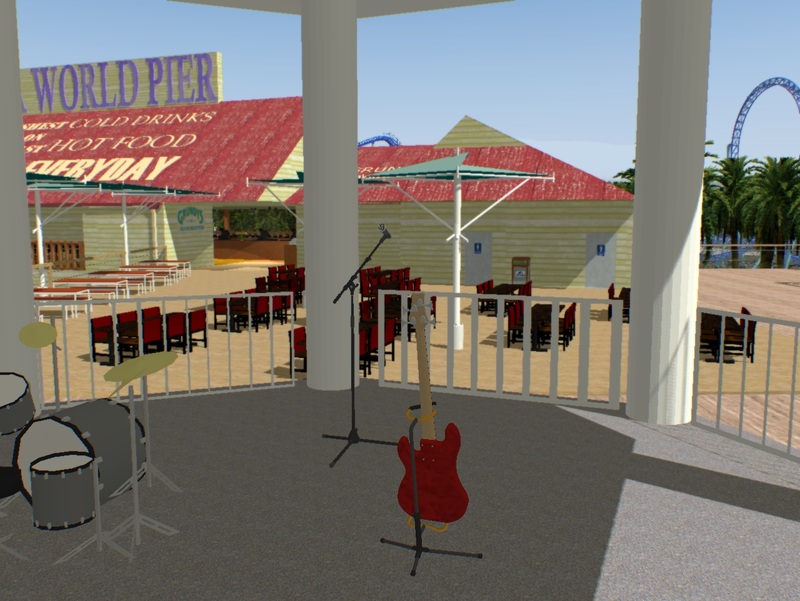 That theme of combing new and old elements into something original also manifests itself in the replacement for Dockside, the Sea World Pier Bar and Restaurant. On the outside, its look is loosely based on the old 'Southport Pier (See above)', on the inside it's a slightly more modern, but still in an old school style. There are lots of photos of hard hat divers, skin divers, longboard surfers, and other sea related photos stretching back in time. The idea is that these photos were put up new, and we never taken down, giving the interior a more timeless feel. Downstairs is a massive arcade, a Gold Coast classic, Grundy's, named for the famous attraction in Surfers Paradise. 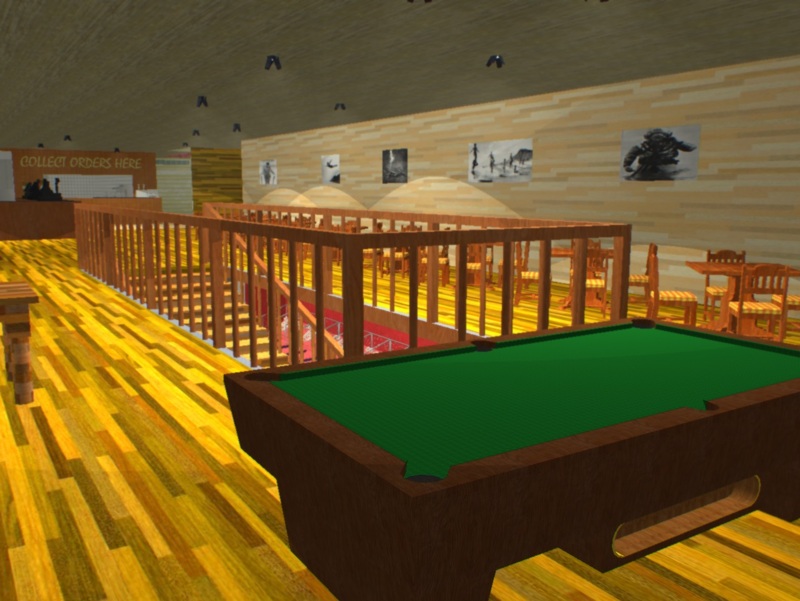 Both the arcade and bar are placed as the Northern Entry to the pier, this should ensure good foot traffic, something Dockside Tavern in it's current state doesn't really enjoy, which does hurt it's revenue a lot compared to Dirty Harry's. The restaurant and bar is place between Sea World Pier, and the nearby Nick Land. 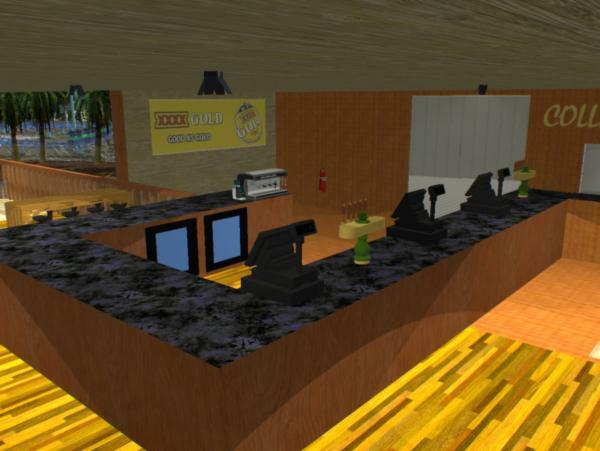 The idea is parents of older kids (like 10 and over) would be able to relax at the bar, while the kids will explore the nearby rides and attractions without being too far away. This combination should be enough to encourage more visits and more spending out of VIP Pass holders, as well as creating a laid back ambiance for less frequent visitors. Outside on the pier is a gazebo that would house live music on weekends to add to the atmosphere of the area. Down stairs is Grundy's, and the draw card here (aside from the massive arcade) is 'Sir Reginald Grundy's Castle Defender'. Sir Reginald Grundy's Castle Defender is a shooting dark ride, on a slightly smaller scale than Justice League 3D, (and with no 3D screens and all the headaches they bring). It's a free attraction, that should hopefully draw people into the arcade, in a similar way that the dodgem cars draw people into Intensity at Movie World. The idea behind the arcade here is that it would work like Timezone in Surfers; people buy game cards pre loaded with cash that they can spend on games, and the more they load, the more perks they get. 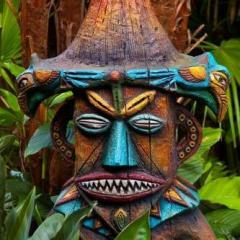 A further revenue raiser would be to allow people to swipe their card when they board the dark ride, this would take the score they make on the ride and convert it into prize tickets (eg 10,000 points = 1 ticket), effectively turning a free attraction into a revenue raiser, but doing so in such a way that wouldn't alienate other guests. It's also somewhat true to theme, the original Grundy's had a ghost train, hence the theme of skeletons in a castle that is shown in the video. The family friendly vibe continues across the water where a modest Ferris wheel takes up residence, roughly where the water fall now stands. It provides a great aerial view of the Dolphin pools, something that made the Skyway a popular attraction for so long. 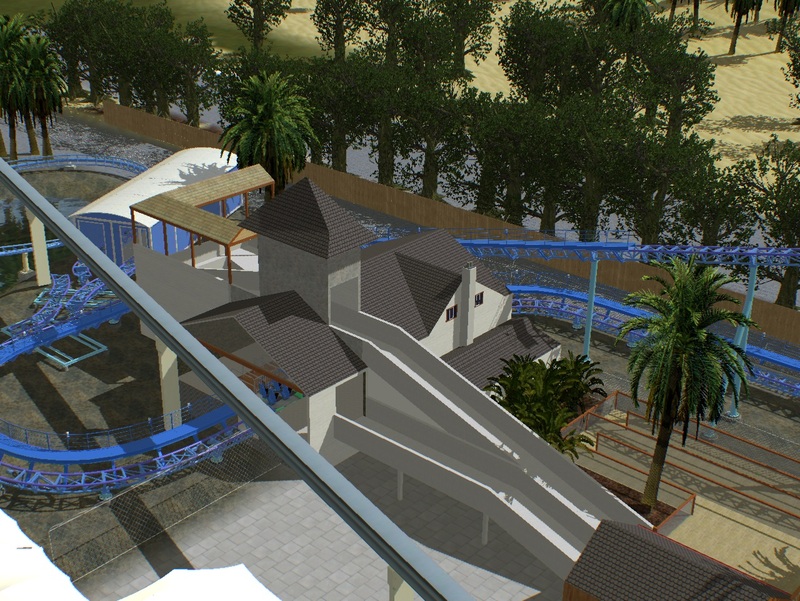 Balancing out the area with something a little more grown up, is the "Wild Surf" Spinning mouse Roller Coaster. The ride begins by taking a dive underneath the Pier, before coming back up through a hole, in the middle of the ride area. It's a short ride, not designed to be too challenging, but adult enough that even a thrill seeker would come off the ride satisfied with the experience. The rest of the pier is given over to a viewing area for Jet Stunt Extreme (and a potential new Nighttime Spectacular) on the main lake. A path also leads towards the east, which serves as an emergency exit, viewing area for a new thrill ride, and potentially as a path to a new Monorail station. A new Monorail station would allow the Pier to be opened early or late exclusively for resort guests, driving either an increase in yields at the resort, or occupancy. There is also room on the Pier to add another flat ride in the future to keep the area fresh. 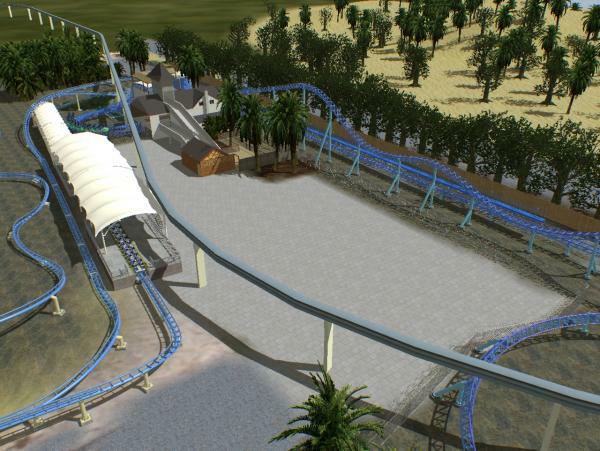 The aforementioned thrill ride would be "Serpent's Fury", a MACK launched coaster, which would actually have it's station next to Jet Rescue. 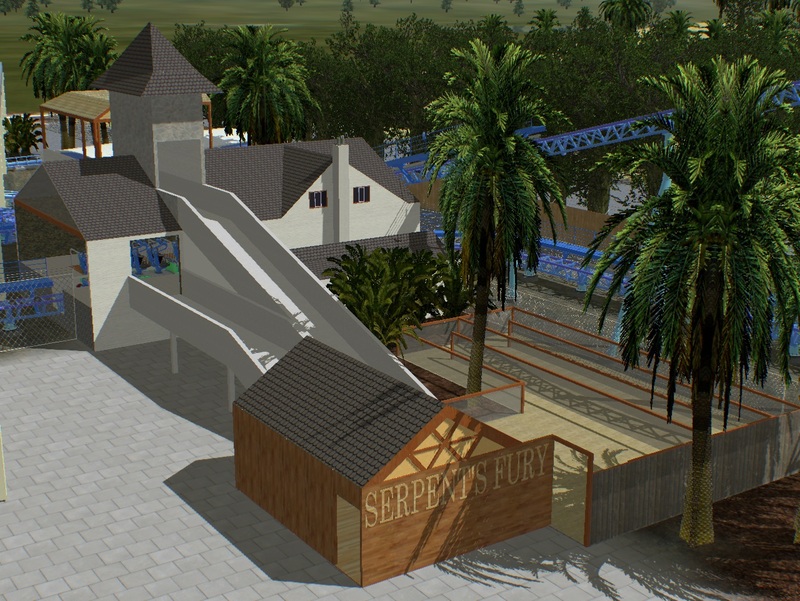 Serpent's Fury would take up some (but importantly not all) of Corkscrew's old footprint, and would take on the role of signature thrill ride at the park, occupying the same role that Corkscrew did for 30 odd years. It's layout would leave room for new flat rides to be added near Jet Rescue, and the expansion of NICK Land. Because the Pier is 2 stories, it is space efficient, and creates other opportunities for development. 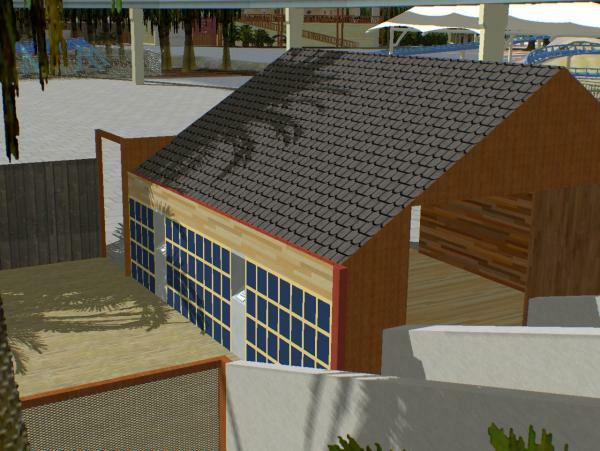 For example, change rooms and a new filtration and pumps system for the Dolphin pools could be built under the pier near where the Endeavour Replica used to sit. This would allow the current change rooms to be demolished, leaving a decent sized plot of land next to the Seal Stadium that could house a new attraction or an expansion of the Dolphin pools. It's easy to see it taking more than a decade to use the land that this attraction opens up. All of this is to improve the park for guests, and improve financial results. As well as the Pier hopefully increasing overall attendance, the arcade and bar would both become important revenue streams, it's also not difficult or offensive to picture carnival games in such an environment, which could also add some extra revenue. 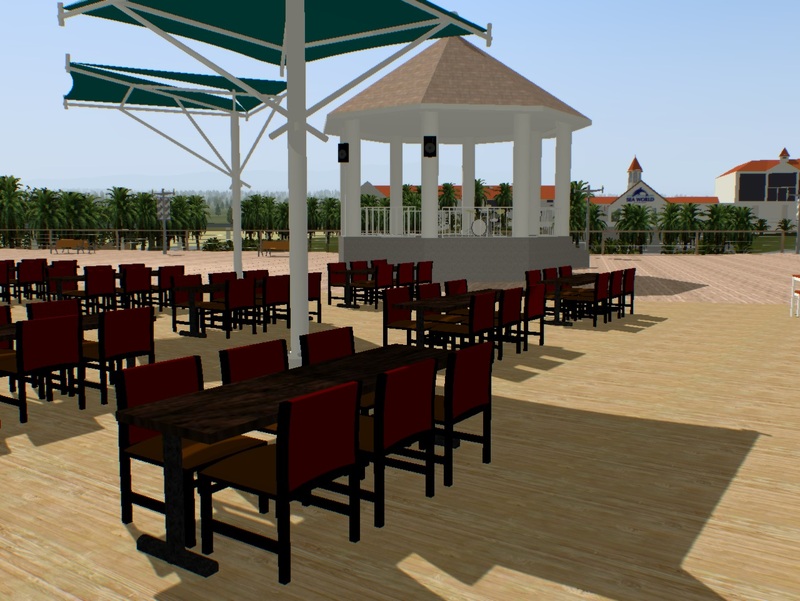 The restaurant/bar would also make a more intimate function venue than anything else the park has, and is also wheelchair friendly. The new mix of attractions would help shake the unfortunate reputation that Sea World has these days amongst many of being 'the one you skip unless you have small kids' to being 'the one with the best mix of everything that's also really close to your hotel'. This isn't all to be built in one go either, it's too big and expensive. It would take a couple years to get it to the point it's at in the video (The Serpent's Fury alone would probably set the park back around $20million, easily swallowing a couple years worth of capex), but I think in the long run it'd be worth it. The theme park industry is a long game, and I think it's at it's best when ambitious things are done. Would easily visit Sea World more often if they did something like this. Fills two voids in the missing thrill coaster and the dark ride. Also like the wheel idea and would give great views over the park and the local area. Before people complain about two coasters the park (ironically like Dreamworld) is missing a signature thrill coaster and would love to see something like "Serpent's Fury" built. Great for what sounds like a part one and would be interested in seeing what you do for an expansion to Nick or added flat rides. Pretty spot on Joz. It's sad that MW gets most of the love - I'd like to see them set up in such a way that regular night time events were a thing - as more people would be able to get there easily - and head to surfers afterwards to keep enjoying the night. Putting aside the expensive factors - what could they realistically achieve in a short period of time - ie: what should they start on first? Should they put the coaster in sans anything else? Or should they build the pier and add to it over time? Once time's up for Creatures of the Deep, VRTP should utilise that land, the rest of the reclaimed land (if it still exists), Corkscrew's old area and Pirate Ship's old area to do something big. THIS is perfect, it reclaims some of what SW has lost, but adds it back with a twist. I've always wanted SW to get a spinning coaster since Gazza posted his design a few years back. 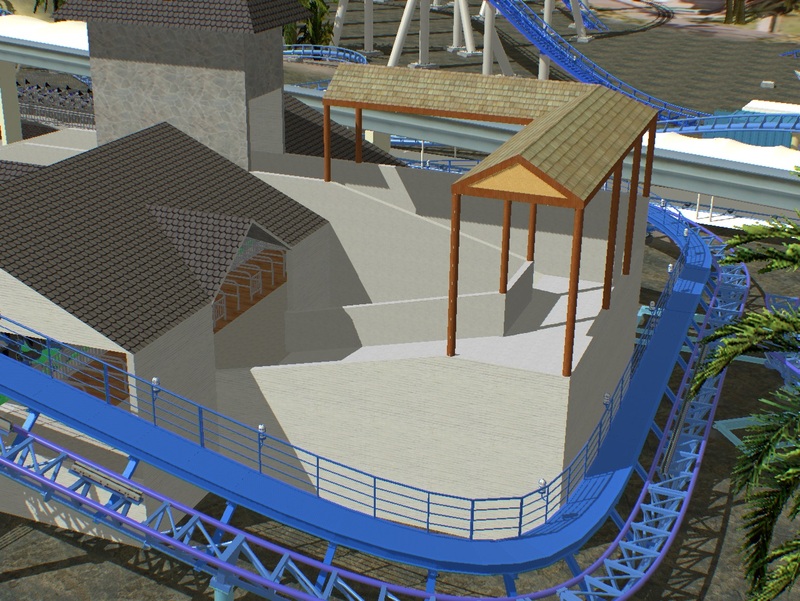 Also their new function area would be able to be even bigger with the arcade presumably moving out. You said there's potential for new flat rides. Two flat rides I've always wanted to see at SW is an S&S Screamin' Swing because I've always thought of it more as a Family thrill and would give a good sensation. Plus a drop tower because it would give such a good view of the area, but with a twist, something like Falcon's Fury so it has a point of difference. A nighttime spectacular would be great as well, something like World Of Colour or the Bellagio Fountain. Obviously lowering them during the day for the show is the only obstacle. One thing I've always wondered if anyone can answer this for me, with the reclaimed land in the lake is the potential for a return of the ski show ever possible? I doubt Village will buy anything from S&S again. @joz - this is freaking great. This is why I like coming to these forums. It's such a grounded, practical, realistic yet totally awesome idea. I would love to see some more screencaps of the area as a whole and how it fits in etc. Holy crap @joz. I wasn't expecting to wake up and see something of this calibre on the forums. Out of curiosity, how long did that take you from concept to execution? It's so well thought out and planned that I'm honestly a little stunned. As for the ski show - I think they could certainly do something like the former ski show - but all of the big setups - where the boats went down to the bridge to establish the formation (ie: the pyramid) as well as build up enough speed would be much harder - and i think the show would suffer as a result. Lowering the fountains so boats and skiers could safely utilise the water throughout the day is an obstacle Disney did not have to overcome. Paradise Bay isn't used for anything else. It would be difficult, but it would be great to see the two coexisting. If I ran Sea World, I'd quit my job and put Joz in charge. 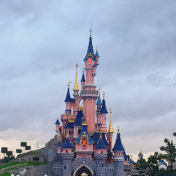 Has the WOC issue been fixed where the fountains and platforms were stuck in the "up" position and in plain sight of guests during the day? I know there was a very long period where they were on show all day and made the bay look very tacky. In later years they started the pyramid setup from where the boats are kept... I only remember this as seeing them mistime moving the boat and all 8 skiers falling into the water as a result is too funny a sight to forget! Quite impressive how are you can going to get in control of Sea World or convince them to do it. I would put a Falcon Fury into SW as well and name it "Kingfisher". Do you think SW could get a height change for a drop tower? This is a point worth raising, what's the update with height restrictions for The Spit these days? Very good, especially creating a new area out of nothing with the pier. One thing (and probably the only thing) I'm not keen on is the Castle Defender shooter ride, as I'd think that Sea World would be after something more "nautical" (and then also not really be that keen on a ride where you shoot our aquatic friends). But other than that, really really good and shouldn't break the bank either. Plus, having a pier into the stunt show lagoon would also make the show a bit more daring too if they can pass under the pier. 2. I think a WOC show might be asking a bit much, it cost Disney an outrageous amount to build the infrastructure in a controlled environment. Sea World's lake is salt water, and tidal. It's also massive. I think a couple floating waltzing water barges placed around the island, fireworks, water screens, and a couple boats would probably be more cost effective, and also make for a better show. Well going off council it seems you can get past the 3 stores limit if council signs off on it being okay. Considering the coaster and any other ride plans for the park aren't full on building but only rise up here and there I don't know why the council would have an issue. Joz I also love the nod to Corkscrew in Serpant's Furt with the corkscrew over the monorail. As for lowering them - Disney solved this problem with WOC, and the design is fairly simplistic (although whether it's patented would be the problem - if Disney can - they have. I think an EPCOT style, bring the barges on and suppliment with crap installed on the island is the way to go. I would love either an Intamin Dome theater or Triotech multilevel mistro shooter in the castle themed to Pirates. "Pirates: Battle of Buccaneer Bay"
Unbeliveable work there @joz and I think your true calling in life could be theme park planning and design. 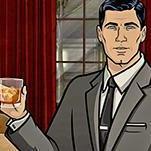 VRTP or Ardent could do worse than hiring someone like you. Only issue I saw was the Serpent's Fury going under the pier would mean that that part of the pier would have to be closed off from the public to prevent people from throwing/dropping things onto the track and car which would be a major safety hazard although installing some clear perspex panels horizontally from the pier over that part of the track enabling people to still see the coaster passing under them would be a decent solution. All in all 2 thumbs up! 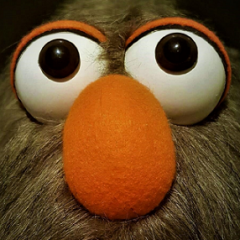 I think expansion of NICK Land would be so far down the track, that it would be folly to plan it out now. Basically see what Nick shows and rides come out in the next few years that seem like they would naturally go together. Same thing for flat rides. Suffice to say, I do think that the area near Jet Rescue should be home to most of the parks true 'Thrill rides', leaving the rest of the park at it's more subdued level. It's actually a really good question. As simple and cheap as it is, it's still a pretty expensive expansion. I think you'd have to split the capital over a few years to get it up, so a couple million one year on engineering and initial Earthworks, a couple the next year on infrastructure, more site prep and hardware acquisitions, and all go the third year to get the Pier, rides and outlets up and running Sans big coaster, which would come online a few years later. I think the big wigs would hesitate to spend the $30million plus to build the Pier and rides (Not even including Serpent's Fury! ), so you'd want to try and spread it out so it's not as big a capex request. In the meantime, maybe keep the park ticking over with an addition to Castaway Bay, new Sea Lion and Dolphin Show, and a Nighttime Spectacular. 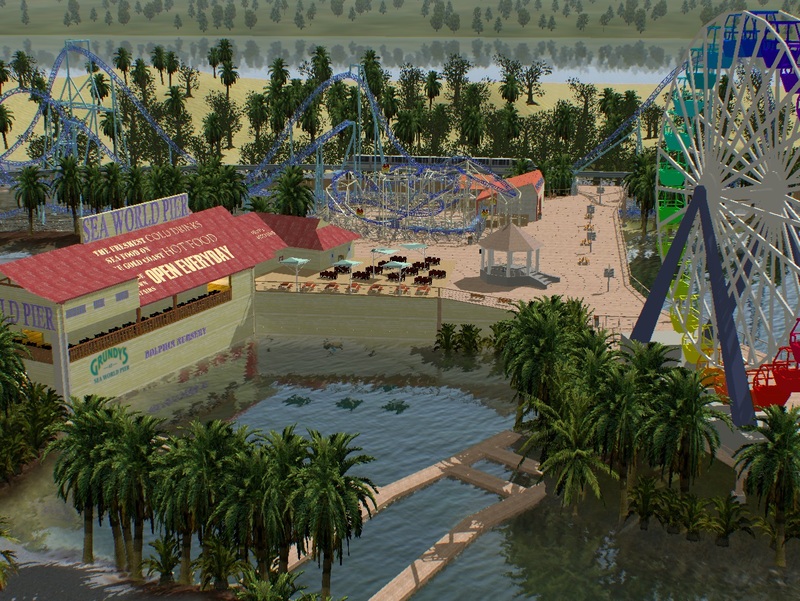 The reason for the pier first is because I think the park needs a bit of filling in, and the Pier is 3 new rides, as well as a new area you can spend a large part of the day. The coaster is something the park needs, but it adds 90 seconds of activity to someone's day. The Pier would also be more cash flow positive than the coaster. Yeah it's totally possible to bring the Ski Show back! The back straight wasn't really used for much except for the run up to do jumps, but you can also do that by doing a lap of the island. It's just if there's a will to do it. 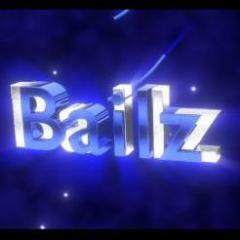 Personally I'd like to see it make a return, but that's just my opinion. I think the hardest thing these days would be getting the talent, but I'm sure there's still some really good skiers out there. As for a Drop Ride, yeah look you're going up against Giant Drop, so it has to be something different, because you'll never win with height. Falcon's Fury (Dammit I totally ripped off that name without realizing!) I think would be a good choice. I do wonder about the price though, and I'd like to know more about how reliable the ride is in the next few years. Intamin rides have a bit of a reputation, and not always for being cheap or easy to maintain. Having said that I thought a Gyro Drop might be good, but it depends how tall you can go. I've mentioned this before, but in case you missed it, about 6 months, and had to learn 3D modeling in that time too! Also again thanks! That's kind of the struggle with a shooting Dark rides in general, and I promise you I went through this exact line of thinking when I was making it. First it was going to be a ride where you're riding 'Submarines', and you're shooting hooks or other things that might be bad for the environment, but that would be totally lame and skew too young. Also considered keeping the underwater thing, and going after Sea Monsters (kind of like Iron Reef at Knott's), but again it doesn't quite feel right, and shooting any Sea creature is really not in the spirit of Sea World, even if it is a monster. Grundy's in Surfers DID have a Ghost Train though, so I do kind of feel it's true to theme, even if it isn't strictly Sea themed. I feel like it's a pretty easy theme, you're helping save a castle that's being invaded by the supernatural. There's nothing to say the castle isn't beside the Sea either. It'd be pretty easy too, just put up a few paintings of a castle on a cliff, and play some crashing surf and storm sounds and the illusion is complete! Truth be told, the ride I designed for the video is very simple, and I think actual industry professionals would be able to come up with ways to make it actually good! It's sad that we live in a world where that is something you have to think about, but sadly it is. I must admit I didn't put much effort into solving the problem, but I agree that it is a problem that Perspex would be able to over come quite effectively. Part of the vibe that I'm going for is of a local, kids welcome, bar. 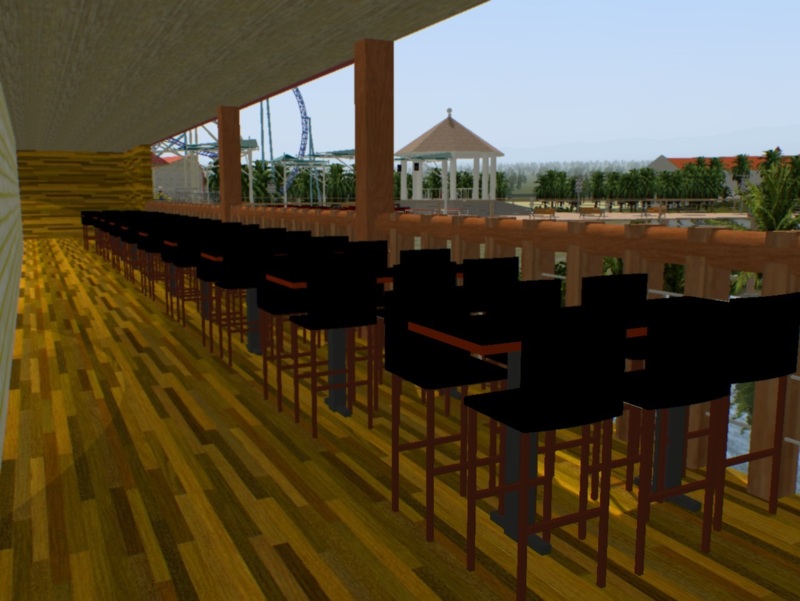 The popular dolphin viewing balcony gets an upgrade, and provides a shady retreat with 72 seats. 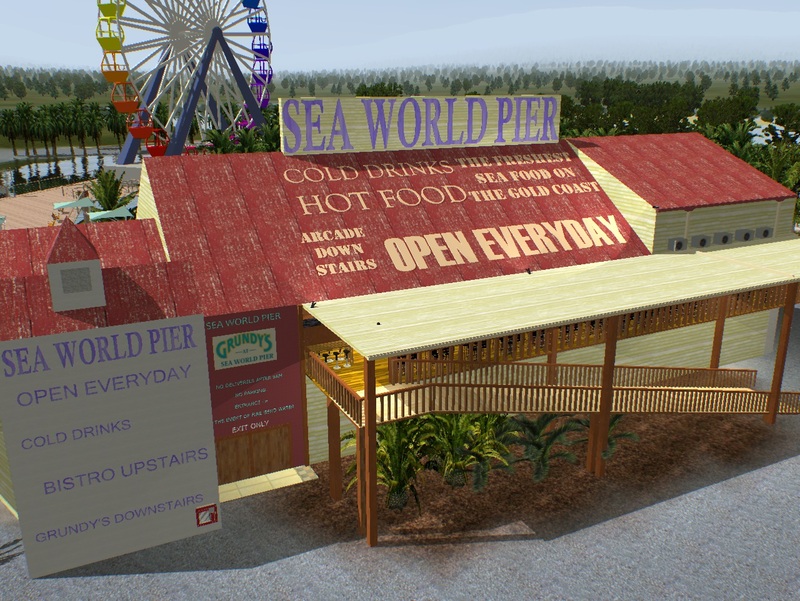 Families wanting to be more in the action can grab a table on the pier itself. Again to encourage local trade, live bands add to the atmosphere on the weekends and during holidays. It'd also be cool to set up an international food festival style event during the day in this area, again to try and get that local market in, having fun and spending money. This is the side that faces NICK Land. It's meant to fit in with that 'Warehouse' look that the area currently has, and the ramp IS the main entrance. True to warehouse theme, underneath the Grundy's logo is the actual loading area for deliveries to the outlet/arcade. The white part of the building that sticks out on the left houses an elevator, to take food and bev products to the kitchen. 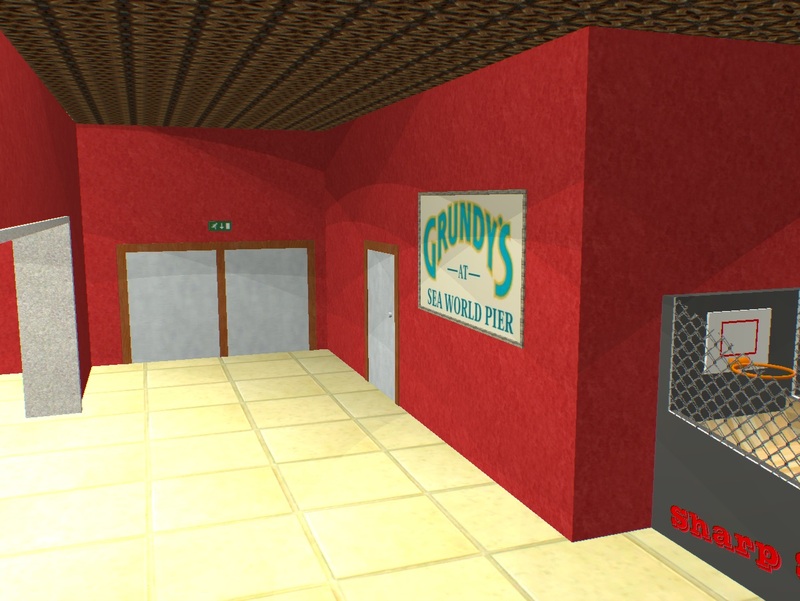 A view looking at the loading area from inside Grundy's. 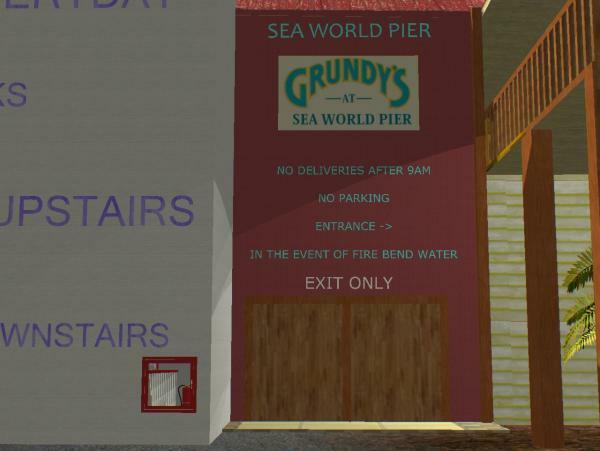 The door to the right of the photo leads to storage area for Grundy's, as well as F&B. Corkscrew's old footprint, with a very bad recreation of Jet Rescue to give you an idea where we are. Note the amount of space for future rides. Serpent's Fury station and queue. Guests enter through the opening on the bottom right of screen, and first complete the outdoor switch backs. After they complete the first part of the queue, guests hire a free locker. This process is administered by the front entry host, and keeps things moving along in the station, because frankly Australian operations need all the help they can get. 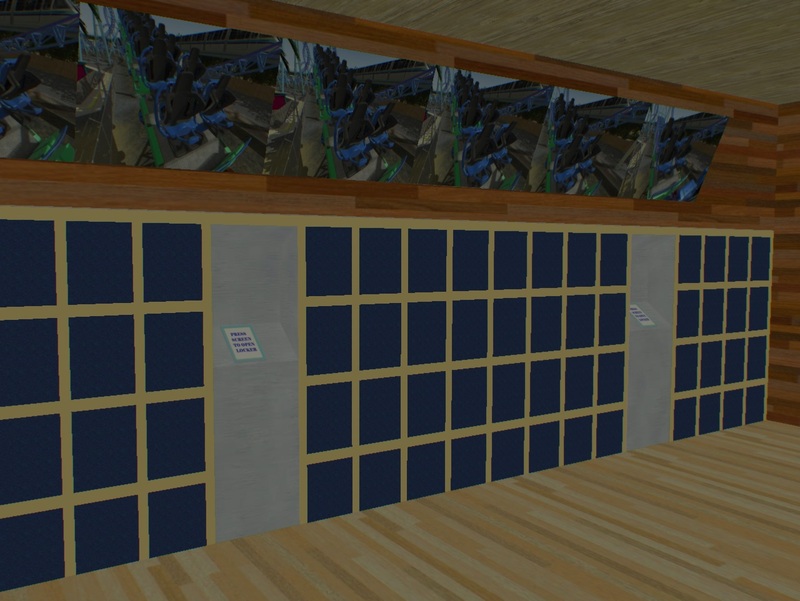 Incidentally, if the average group has 3 guests, and they share lockers, there are lockers here for 228 people. . The queue then goes over the station, and enters the building from the far side. This type of station design means that guests in line have a good view of the process before they go through it, again hopefully speeding up the loading/unloading process. There is also no dedicated unload station, this attraction would be ideally run by only 3 people. (Entry host, loader, unloader). On ride photos are displayed inside the shop, and inside the shop is also the other side of the lockers. Guests retrieve their money and belongings in the shop, and are straight away able to grab that impulse purchase of an on ride photo. Take that Superman shop! Any problems with the lockers on this side are seen to by the retail staff member. That second explanatory post has absolutely sold me on your concept, @joz. I just have a couple of ideas that popped into my mind over the past day or so. Secondly, you could also turn that small area with Jet Rescue and Serpent's Fury into a themed area based around oceanic and deep-sea exploration (think submarines, underwater bases, etc.). I just think that could look a lot better than just slapping on a generic name and calling it a day. Finally, you mentioned you learnt 3D Modelling while doing this project. Out of curiosity, what program did you use? Blender? Trimble Sketchup?